Daniel Buchanan, tenor, is a multifaceted artist active as a singer, actor, composer, pianist, and music educator. Last season, he made his European debut singing St. John Passion with Finland's Kuninkaantien Muusikot and performed the role of Nemorino in The Elixir of Love at the Portland Opera. 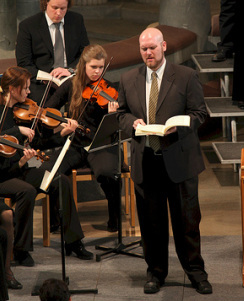 Other recent performances include the Portland Chamber Orchestra (Messiah), Portland Opera (Madama Butterfly), Walla Walla Symphony, a tour of the Greek Islands with Cappella Romana, title role of Werther with Opera Theater Oregon, Beethoven’s Ninth Symphony with Newport Symphony, and Mozart's Mass in C Minor at the Shenandoah Valley Bach Festival. For three years, he performed regularly with the Houston Grand Opera, including the roles of Tonio in The Daughter of the Regiment, Count Almaviva in The Barber of Seville and The Witch in Hansel and Gretel. Other opera roles include Ferrando in Così fan tutte, the title role in Albert Herring, and Don Ottavio in Don Giovanni. Mr. Buchanan enjoys frequent appearances with the Oregon Bach Festival (St. John Passion, Christmas Oratorio), Southwest Florida Symphony, Bach Society of Houston (St. Matthew Passion, Brockes Passion), Santa Fe Desert Chorale, and Houston Chamber Choir (B Minor Mass). Since 2005, Mr. Buchanan has sung with the internationally-acclaimed vocal ensemble Conspirare, based in Austin, Texas. With the group, he recorded the Grammy-nominated release A Company of Voices, which was aired nationally on PBS. Conspirare was a featured choir at the Wold Symposium on Choral Music in Copenhagen in 2008. He is also a founding member of Opera Vista, an innovative opera company based in Houston, Texas. Presenting a festival of contemporary opera every year, Opera Vista has become a vibrant addition to the arts community. With the company, he sang in Amy Beach’s Cabildo, including performances at the French Quarter Music Festival in New Orleans. Mr. Buchanan has served on the voice faculties of the Conservatory of Music at Wheaton College and Lone Star College. He is also the founder and primary instructor of an active voice studio called Resound NW. He lives in Portland, Oregon with his wife, Abby. "Daniel Buchanan as Werther...drove up the tension with outstanding acting and singing. [He] excelled in conveying a variety of emotions that ranged from volcanic outbursts of anger to the haunting lyricism of longing and despair." 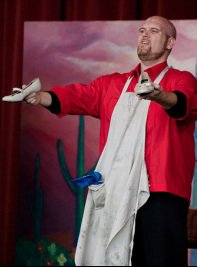 "Led by tenor Daniel Buchanan, Opera Theater Oregon mounted a very entertaining and unique improvisational show...Displaying an impeccable sense of timing and a keen sense of humor, Buchanan complimented the storyline with short phrases and a variety of wordless sounds." "The romantic leads - Hilarion and Ida - were ably handled by the sweet-voiced tenor Daniel Buchanan and the robust soprano Kimberly L. Fuselier." "Dominique You...was powerfully sung by tenor Daniel Buchanan." "Sung by voices equal to any you're liable to hear from the Schnitz to the Met..it's impossible to resist the force and clarity of [Buchanan's] singing."